This rich, Creamy Peanut Butter Mousse dessert recipe takes ten minutes to make and will not fail to impress for an every day treat, holidays, or birthdays! I’ve raved about the summer we have had here in upstate New York so many times on my blog these last few months that you’re probably sick of hearing about it. Well, guess what? I’m not done yet. We had another heat wave a couple of weeks back and it just so happened to fall on the week of Mr. Wishes’ birthday. 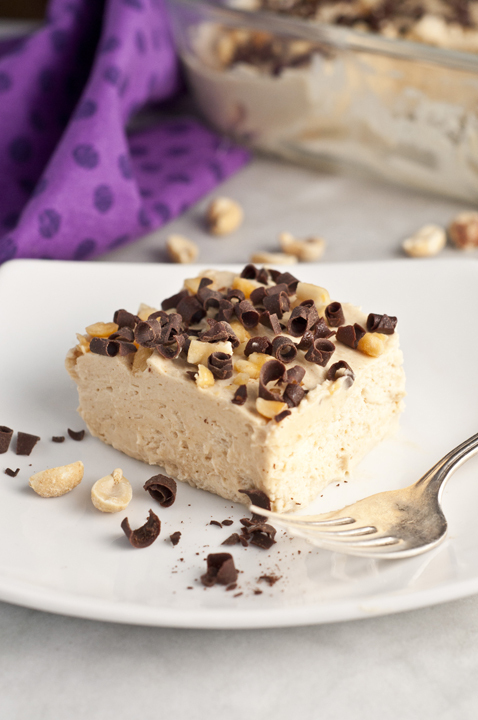 This Creamy Peanut Butter Mousse recipe comes from The Weeknight Dinner Cookbook: Simple Family-Friendly Recipes for Everyday Home Cooking, which was just released and written by my dear friend Mary of the blog Barefeet in the Kitchen. Mary and I had “met” online years ago when I first started blogging. I had the pleasure of meeting her in person when I went to BlogHer Food Miami back in 2014. Her smiling face was the first familiar face I saw when I was registering at the conference. She’s a great person and an amazing cook! Every single recipe I have made of hers always blows my taste buds away. She’s one of those bloggers I can trust that her recipes will never fail me (and I have made several of them). I loved Mary’s note in her book under the Creamy Peanut Butter Mousse recipe that suggested sprinkling nuts on top so that everyone eating it knows the dessert contains nuts in case there are allergies. I took her suggestion and loved the bit of crunch that it gave the mousse with each and every bite! Needless to say, this mousse is addictive and completely delicious. It will serve you well at any potluck, holiday, birthday, or just when you’re having company over for dessert. 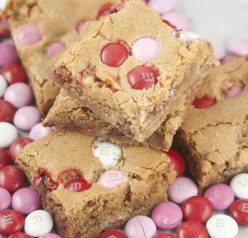 Here are some other yummy peanut butter recipes for your enjoyment. 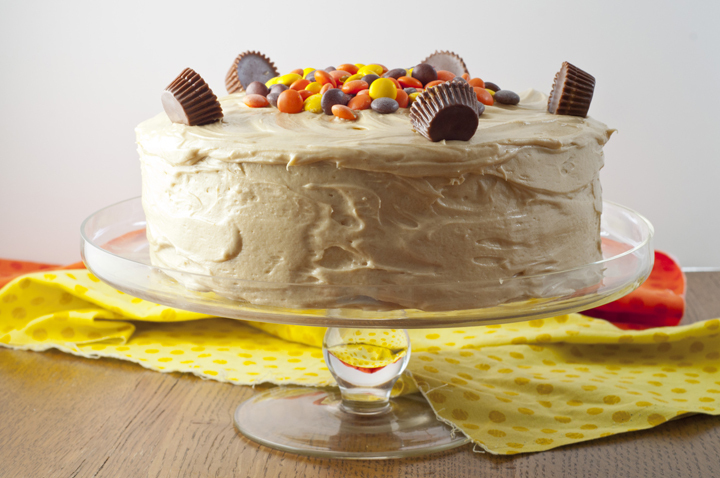 Definitely make this for the peanut butter lover in your life and check out Mary’s cookbook soon for other great recipes – you won’t regret it! You should also try these Double Peanut Butter Cookies from my friend Michelle! Pour the cream into a mixing bowl and beat with an electric mixer until peaks form, about 2-3 minutes. Scoop the whipped cream into a small bowl and place in refrigerator. 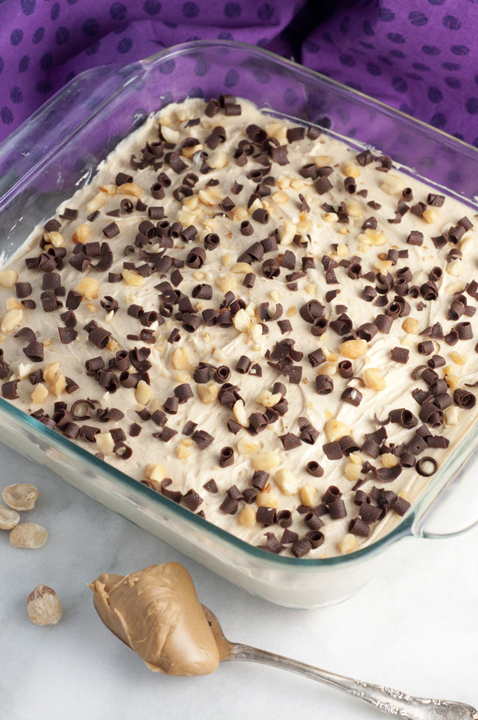 Combine the cream cheese, peanut butter and vanilla in a mixing bowl and beat until smooth, about 2 minutes. Add powdered sugar and beat again for another minute. Add the milk and beat until smooth, about 20-30 seconds. Use a spatula to gently fold and stir in the whipped cream until combined. Transfer to an 8-inch square pan (can also serve in individual serving dishes or trifles). Top with shaved chocolate and chopped peanuts, if desired. Serve immediately or chill until firm. 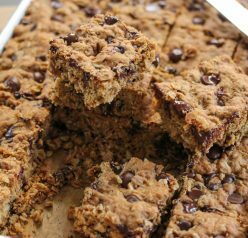 I cut it into squares after chilling it and served on dessert plates. Enjoy! I might have to make this for my husband soon. 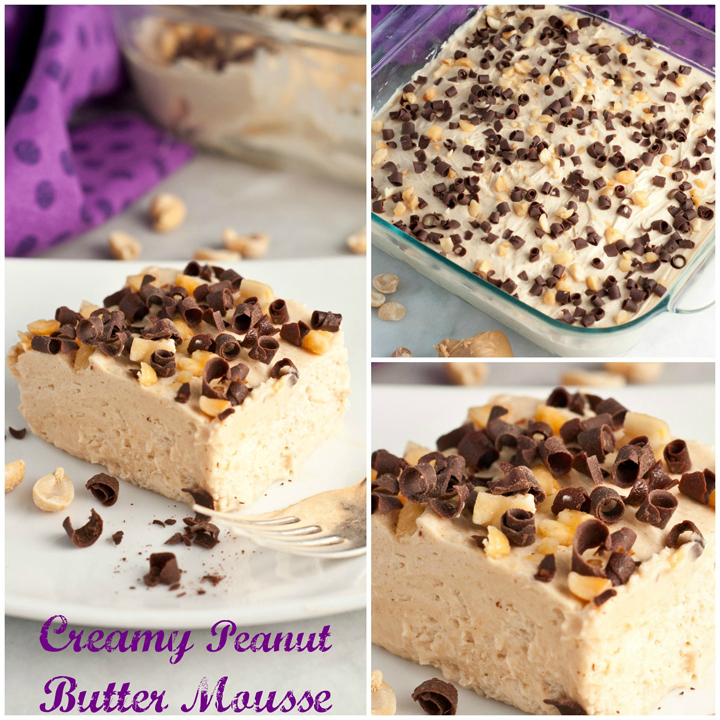 He adores anything peanut butter, so this mousse looks right up his alley! I am a peanut butter ADDICT. So this looks perfect!!!! YUM-O!! I’ll take the entire pan please. 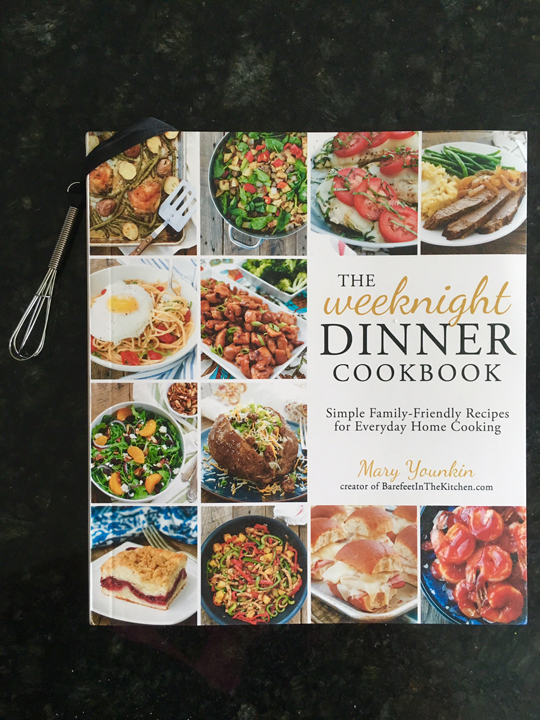 Mary always has great recipes and I love her new cookbook! 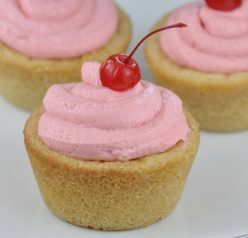 Such easy recipes that taste great! I LOVE this book! And this recipe is so interesting. I’ve never seen a mousse that you can slice like that! I have to try it. Lol – We just had our house painted and when they did the door, guess what – yup, we had new houseguests in the form of flies and other flying insects for about a week – I went to home depot and bought all those hanging fly traps – yeah – our house was a bit cray cray for bit! But back to this – it is such a gorgeous mousse, Ashley! You sure are right – this is sure to be a hit at any potluck/get together! I am all about this! I’m not much of a baker. I don’t have the patience. I love that this comes together so easily and so quickly. I think even I could handle this! I am so happy that you’re enjoying the cookbook! Your photos of the mousse are absolutely gorgeous. I love that blogging brought us together. You’re a blessing in my life, Ashley! Meeting people like you makes it all worth it!!! it’s a great idea for my son’s dessert. he love everything about peanut butter. my son must be smiling all day, i’m so excited. thanks for sharing, Ashley. Can I put a choc mouse on top of this layer? Will it hold? And do you have a choc mousse recipe, lol? The pb one was AMAZING!!! I made this with my 4yr old daughter who I’m currently teaching how to bake ☺ She is the pickiest eater alive, so I’m trying to get her more interested in food in general. She even liked this mousse! She did say it was really sweet, but most things she’ll just spit out and start crying. So – progress, not perfection. It was so much fun whipping our own cream and mixing all the ingredients together to make something delicious for all of us to share ???? My 1yr was screaming for more!! And so was my husband ???? I used this recipe to make chocolate glazed peanut butter bombers, and they came out magnificent! Highly recommend!